Frida, Robert Xavier Rodríguez’s biopic opera about Frida Kahlo, is the third production of Florida Grand Opera’s 78th Season and a company premiere. Rodríguez’s colorful and passionate R-rated operatic story of Mexico’s legendary artist is scheduled for two performances at the Miramar Cultural Center in West Broward on March 16 and March 17, three performances at the Miami-Dade County Auditorium from March 21 through March 24, and two performances at the Parker Playhouse in Fort Lauderdale on March 28 and March 30. Her soul yearned for freedom. Frida is the story of renowned Mexican artist Frida Kahlo, wife of the great muralist Diego Rivera. Her tortured life unfolds in a flowing succession of scenes, acted and sung by six women and five men in a variety of guises, masked, plain-faced, and as two- or three-dimensional puppets; shadow puppets and projections are involved. Diego’s preoccupation with art and other women shrivel Frida’s soul, and her demands for love drain him; they need one another desperately. Divorce is imminent. Frida’s health deteriorates; only painting permits emotional release, translating her agonies into a series of canvases. Her fate is to live alone, engulfed by pain, but her paintings live forever, reflecting hidden dreams and inspiring courage to transcend conventional boundaries. As a student, Frida spurned the taunts of other girls, turning instead to the politics of the revolutionaries. When a near-fatal bus accident kept her bedridden, she found her own path to freedom in her paintings. Through love, pain, tragedy, and ultimately death, Frida’s identity and art remain a fierce cry of independence. 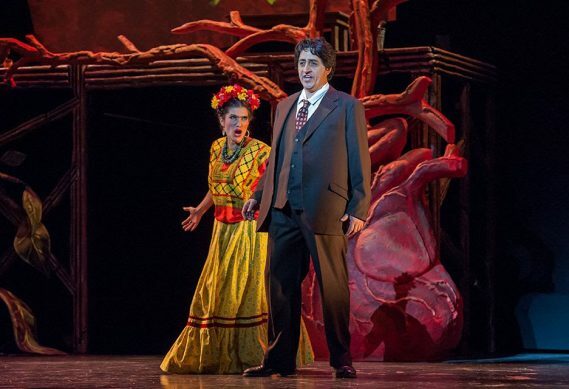 Rodríguez describes Frida as being “in the Gershwin, Sondheim, Kurt Weill tradition of dissolving the barriers and extending the common ground between opera and musical theater.” In keeping with the Mexican setting of Frida’s life, the score features mariachi-style orchestration with authentic Mexican folk songs and dances and the composer’s own “imaginary folk music,” tangos and colorations of zarzuela, ragtime, vaudeville, and 1930s jazz — “romantically dramatic” (The Washington Post) and full of “the composer’s all-encompassing sense of humor” (The Los Angeles Times). The colorful score is a perfect match for Frida Kahlo’s passionate art, conducted by Roberto Kalb with the Florida Grand Opera Orchestra*. This opera reflects Frida Kahlo’s hidden dreams and inspiring courage to transcend boundaries. FGO debut by Bass-baritone Ricardo Herrero as Diego Rivera. Frida Kahlo de Rivera, born Magdalena Carmen Frieda Kahlo y Calderón, was a Mexican painter known for her self-portraits. Kahlo’s life began and ended in Mexico City, in her home, which is known as “La Casa Azul,” the Blue House. Her work has been celebrated internationally as emblematic of Mexican national and indigenous traditions, and by feminists for its uncompromising depiction of the female experience and form. Mexican culture and tradition are important in her work, which has been characterized as naïve art or folk art. Her work has also been described as surrealist, and in 1938 André Breton, a principal initiator of the surrealist movement, described Kahlo’s art as a “ribbon around a bomb”- Frida rejected the “surrealist” label imposed by Breton – as she argued that her work reflected more of her reality than her dreams. Tickets are on sale now. Tickets start at $35, and can be purchased in person at the Florida Grand Opera Box Office at the Doral Center at 8390 NW 25th Street, Miami, FL 33122, online at www.FGO.org, by phone at 1.800.741.1010, or email at Sales@FGO.org.